Last summer Motorola introduced its new premium Moto Z smartphone family. More than a simple redesign with the latest components stuffed inside, the Moto Zs added a modular component. Motorola’s optional Moto Mods snapped onto the phones’ flat backs with powerful magnets, making it easy to swap from a large speaker to a pico-projector to a battery pack all without requiring a reboot or any software fiddling. Among the small group of modular phones, Motorola’s solution is clearly the best, but it still comes with some compromises. The phones can feel bulky and heavy with Moto Mods attached, for example. 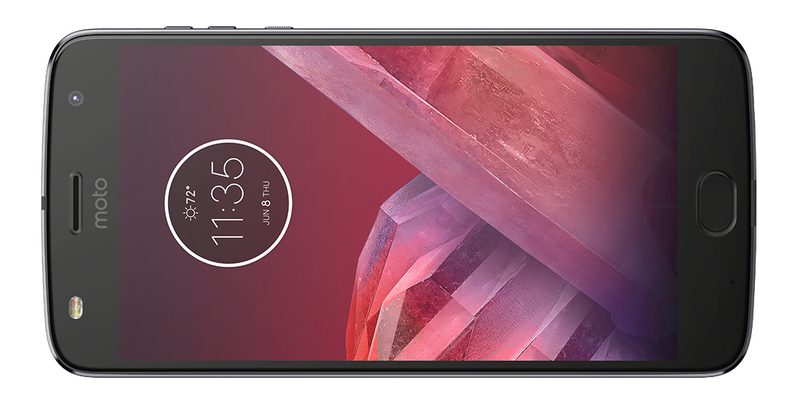 Motorola tried to address this with the Moto Z (the middle child of the family) by making it as thin as possible (only 5.19mm thick), which limited battery size to a mere 2600 mAh. The Moto Z Play, a mid-range model that served as the entrypoint to the Moto Z family, was a pretty solid offering, with a decent camera that produced better images than the more expensive Moto Z. The Snapdragon 625 SoC and its 8 Cortex-A53 CPUs offered acceptable performance as long as you did not push it too hard or expect too much, but the higher-performing Snapdragon 650 would have been a better choice for a phone that cost more than $400. Paring those power-sipping A53 cores (on a 14nm FinFET process) with a fairly large 3510 mAh battery did give the Moto Z Play excellent battery life. With summer upon us once again, Motorola is refreshing its Moto Z lineup, starting with the Play. The new Moto Z² Play is not exponentially better than the previous model, however. Its progression is more piece-wise linear, remaining largely the same with only a few positive changes. 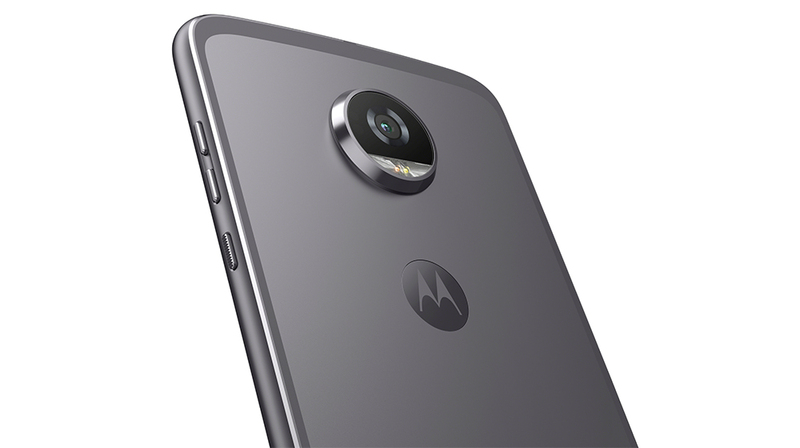 The Moto Z² Play’s biggest (potential) upgrade is the rear camera. It uses a new 12MP sensor that trades resolution for improved autofocus performance. Its 1.4µm pixels are split into two photodiodes, allowing each pixel to perform phase detection. This greatly improves AF accuracy and speed—up to twice as fast as regular PDAF. Dual-pixel PDAF is part of a hybrid AF system that also includes laser autofocus, which has an extended range up to 5 meters (16 feet) and works better in low-light situations, and contrast AF as a fallback option. The Z² Play also comes with a faster f/1.7 lens array that lets in 25% more light, which should improve image quality and help compensate for the lack of OIS. The front-facing camera gets a small upgrade too. It still uses a 5MP sensor with 1.4µm pixels (presumably the same one as the previous Z Play) and an f/2.2 lens array; however, instead of a single LED flash (a nice feature that’s still fairly uncommon), the Z² Play’s front camera comes with a dual-color LED flash just like the rear camera that should help improve color accuracy when taking selfies in the dark. Inside the Z² Play’s aluminum frame is a Snapdragon 626 SoC, whose only improvement over the Z Play’s S625 is a small 10% bump in peak CPU frequency that you will not be able to notice during normal use. By rushing the Z² Play to market—the original Z Play has only been available since last September—Motorola missed an opportunity to improve the user experience in a meaningful way by using the new Snapdragon 630 (which replaces the S626 in Qualcomm’s lineup) that supports the latest memory and storage standards and includes an upgraded GPU, DSP, ISP, and modem. If Motorola really wanted to blow our minds, it could have used the new Snapdragon 660, Qualcomm’s premiere mid-range SoC that provides flagship-level features and performance. The Z² Play’s eight Cortex-A53 CPU cores and Adreno 506 GPU, which supports the OpenGL ES 3.1 and Vulkan graphics APIs, are still paired with 3GB of LPDDR3 RAM and 32GB of internal storage like the Z Play; however, there's now an optional configuration with 4GB of RAM and 64GB of storage too. This bumps the price to $500, though, which is moving into flagship territory and is pretty expensive for a phone with all A53 cores. The rest of the Z² Play is largely the same as the previous version. It still comes with a 5.5-inch AMOLED display from Samsung with a 1920x1080 resolution. The PenTile subpixel layout means the effective pixel density is less than a 1080p LCD of the same size, resulting in some loss of sharpness. The Snapdragon 626 SoC includes the same X9 LTE modem as the S625. It supports 2x20 MHz carrier aggregation on both the downlink and uplink, providing up to 300 Mb/s and 150 Mb/s, respectively. Other connectivity options include Bluetooth 4.2 LE, NFC, FM radio, and 802.11n Wi-Fi (sorry, no 802.11ac) with 2.4GHz and 5GHz bands. The original Z Play’s design also survives largely intact. The back of the phone is still flat with a proprietary connector near the bottom to accommodate Motorola’s Moto Mod accessories, and there’s still a raised, circular camera module that helps anchor the Mods and Style Shells in place. The Style Shells come in a variety of colors and materials, allowing you to customize the phone’s appearance (it looks unfinished without one, which is why one is included). The small volume and power buttons sit near the top on the right side—out of the way so you do not press them accidentally—and a USB 3.1 Type-C port and 3.5mm headphone jack are on the bottom. The biggest change around front is a larger, pill-shaped fingerprint sensor that replaces the Z Play’s rather small, square unit, which should make it easier to find and use. It also supports Motorola’s (optional) one-button navigation feature that replaces the onscreen navigation buttons with gestures; swiping left on the fingerprint sensor goes back, swiping right opens recent apps, tapping it goes home, and long-pressing it locks the phone. It appears Motorola placed the display circuitry in the upper bezel (behind the ‘moto’ logo) like it did for the Z Play, a good design decision that keeps the lower bezel a more reasonable size. This means the upper bezel is larger than usual, but this does not negatively affect one-handed use like a big lower bezel, and it helps the front look more balanced. Because the Z² Play fully supports Motorola’s existing Moto Mods—along with some new ones, including Style Shells with wireless charging and the Moto GamePad—it’s essentially the same size and shape. The one exception is thickness: Motorola sliced off 1mm. The thinner profile and 20 fewer grams of weight should make it feel less bulky than the Z Play. Unfortunately, this means battery capacity also gets trimmed by nearly 15%. While the Z² Play’s battery life should still be better than average, I’m not convinced that tempering one of the Z Play’s best features is a great idea. On the flipside, you get a lighter phone that still comes with Motorola’s TurboPower fast-charging technology and the option to slap on a Style Shell with wireless charging or a 2220mAh Power Pack, although these options add to the overall price of the phone. 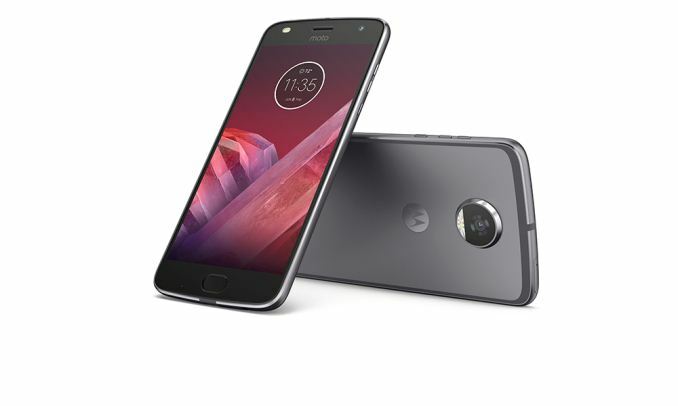 The Moto Z² Play will be available exclusively on Verizon in early July (without the DROID branding), but pricing is not available (the previous Moto Zs were discounted when purchased through Verizon). It will also be available unlocked directly from Motorola.com later this summer for $499 (4GB/64GB).